How do you get to where you really want to go? Use this simple technique to achieve your business goals. James Schramko here and I’m going to give you a tip about how you can simplify things. 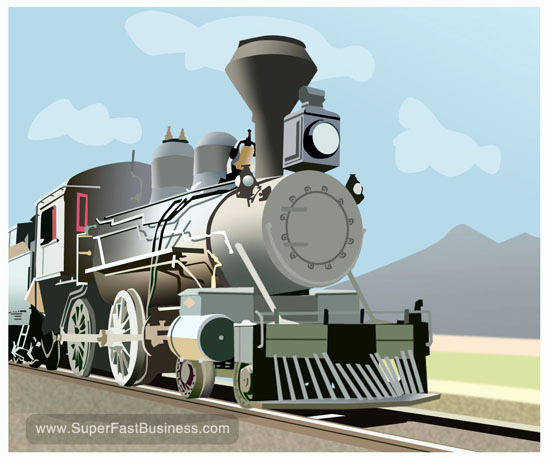 Think about your business as a big powerful locomotive engine and you are pulling that business along, that vehicle. You’ve got electricity, you’ve got diesel power or whatever you’re using, you power it along. And to get to where you need to get to, say the station, you just need two tracks. Two tracks powering you through to that station, just two. How simple is that? Two pieces of metal that are laid out from here to where you want to get to and your only job is to follow the tracks. So, what you want to do is you want to think about “Which station do you want to get to?”, and then think about what will the tracks look like that get you there and keep them simple. And then, you power your locomotive down those tracks. And when logs come in front of the tracks, remove them. That’s objections, that’s challenges, that’s staff things, that’s customer things, it’s system things, they break. It’s okay, it happens. That’s just logs on the track. Remove the logs, get out with your chainsaw (eeengw!!) and remove the logs. So hopefully, by designing a simpler system, just think about where you want to get to, what will the tracks look like that get you there and you power up your locomotive and start your journey. It’s actually a lot simpler than you think. As long as you know where you want to go and you do the right things to get there, you’ll be okay. Stop these left and right turns. You can’t with the track, that means turning off bright shiny objects, reducing down your inbox and stopping pursuing the “opportunities” that keep bobbing up in front of you because they’re more exciting than following the track. The track can be a bit boring sometimes but it gets you where you want to get to. Probably for most people and perhaps for you, it is following up prospects, converting them into sales and then keeping them as great customers by having a continual relationship program in place to look after them. So maybe, you need to get some OfficeAutoPilot software or something like that to be able to build your tracks. Maybe you need to update your website to build your tracks. But once those tracks are in place, keep fuelling it and driving forward. Well anyway, I hope you’ve got some gain from this video, I’m James Schramko and if you like this sort of stuff and if you have a six figure or more business, we should talk about you joining SilverCircle.com, which is where I have my business masterminds. And if you’re not quite in the six figure mark yet, perhaps have a look at SuperFastBusiness.com where I could really help you with your internet business. You take care. Tell us how this technique has helped your business and leave your comments below. Good Stuff James! :) Thanks for this, might have just helped me make an important decision. Great stuff James. I am working on the six figure stuff. So far I’m looking at moving the decimal points along a bit lol. I have though in 10 weeks started to build a profitable business and very firmly have my train on the right track to my ultimate destination.